1 single O+ Mini in our cooling Peppermint flavor. 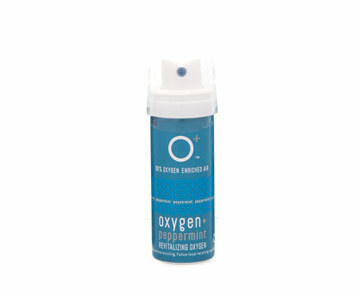 Each canister contains over 24 breaths of 95% enriched oxygen. The flavors in O+ products are food and beverage-grade flavors approved for use by the FDA and the Food Extract Manufacturing Association. We're not blowing hot air. Research on the benefits of supplemental oxygen abound. Get the science behind the O+ breath. Fatigue has been reported by several studies as one of the most common symptoms experienced by people worldwide. A Harvard University study concluded that 77% of Americans cite lack of energy as a top health concern. When energy drops, performance drops. Conditions that can reduce your body's oxygen levels - or low-blood-oxygen levels ("LBO") symptoms - include air pollution, jet lag, breathing stale air that has less than the normal 20-21% oxygen, higher altitude, intense workouts and sports activities, overexertion, alcohol consumption and stress. Oxygen is the key ingredient in the production of energy.